We first heard about the nationwide Second Amendment rally through a flyer that someone gave us at SHOT Show 2013 and now word of the rally is spreading like wildfire with more than 13,000 Facebook users confirming their attendance. The peaceful protest is slated to take place at every state capitol across the country on Friday, the eighth of February at 10AM at each state’s respective capitol building, although we have heard buzz that some locations have had to reschedule for various reasons (e.g. Maryland moved to February 6). 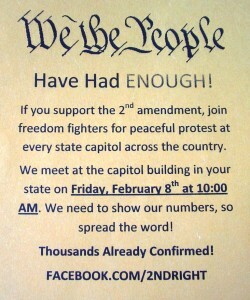 Keep spreading the word so that all Second Amendment advocates have the opportunity to attend. We’ve started a thread for the event on the GunLink Forums for users to discuss the event, arrange transportation, share information, pictures and more.